We’re excited to announce the teams working on this year’s ‘Wearing the city’ designs, to be unveiled by Monash University Art, Design and Architecture (MADA) at MPavilion on 14 November! The idea behind ‘Wearing the city’ is to create unique wearable forms inspired by iconic buildings. The project draws on a fabled history of architectural dress-ups. At New York’s Beaux-Arts Ball of 1931, at least two dozen architects came dressed as buildings they had designed—including Ralph Walker as the Wall Street Building, and William Van Alen as the Chrysler Building, and Leonard Schultze as the Waldorf-Astoria. MADA’s take on this tradition is to team students with leading Melbourne architecture practices to translate iconic local buildings into parade-able outfits. Following 2014’s ‘Wearing the city’ project, which focused on well-known Melbourne exteriors, a new group of talented students will reveal wearable forms inspired by 11 historic and contemporary interiors, including the NGV Great Hall, St Paul’s Cathedral, the Shrine of Remembrance additions and NAB Docklands. This year, the teams are being guided by MADA lecturers Miriam Borcherdt and Cate Hall. Without further ado, please meet the 2015 teams below. And we hope you can join us at MPavilion on Saturday 14 November from 5pm to 7pm to see their designs and hear from the judges. 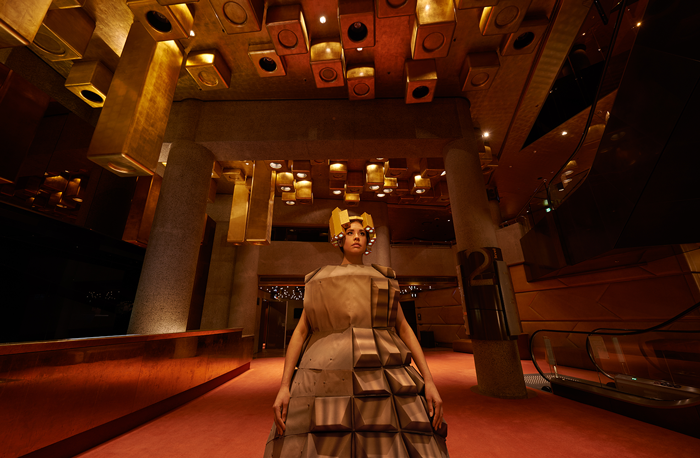 Main image: Design by Kia Achielleos and Celina San Jose (of Hamer Hall, Roy Grounds / Interior: John Truscott, upgrade by ARM) from ‘Wearing the interior city’. Photo by Matthew Stanton.